PHYSICAL FEST IS BACK FOR 2017! Tmesis Theatre is proud to announce that Physical Fest, Liverpool’s international physical theatre festival, is returning for 2017 and is set to be bigger and better than ever! This year, the festival will take place from Friday, 26th May to Saturday, 3rd June – the full programme will be announced soon. One of the highlights of the event will undoubtedly be Young Fest – a weekend of free activities for young people and their families at Bluecoat. Taking place at an earlier date this year during the Easter holiday period from Saturday 22nd – Sunday 23rd April at Bluecoat, Young Fest brings exciting interactive workshops and performances ranging from a superhero dance party to a monster disco, with activities suitable for three-to thirteen year-olds and families. Capes at the ready for the Superhero Dance Party with Jennifer Essex. Suitable for children aged 3 to 6 years old, this fun dance workshop will let your little ones can discover their superhero selves. Faster than speeding bullets and able to leap tall buildings in a single bound, they’ll dance their way through a heroic 45 minutes. Later, Essex returns with Space Rebel Princess. A young princess dreams of becoming an astronaut, but her parents have more aristocratic goals for her. With your help, she must leave her fears behind and boldly go where no princess has gone before! Suitable for children aged 3 to 8 years old (families welcome). Join Impropriety in making epic stories from nothing but your imaginations. Impropriety use improvisation games and exercises to create theatre on the spot. All the exciting, strange, wonderful characters and stories you can create will be brought to life in this fully interactive workshop. There will be clowning around aplenty in the Acrobatics & Physical Comedy Workshop. Suitable for children over 8, Polichinelo Circus specialise in acrobatics and physical comedy and have performed, amongst others, for CBeebies. Marcelo and Jordan will be leading an acrobatics workshop full of fun for all abilities. Ever wondered what happens to all the rubbish and where does it go? Then head over to The Rubbish Show (suitable for all ages). Produced by Graham Hicks from the Eggpeople, third year Arden students create their first outdoor piece of theatre. There will be more amazing workshops for youngsters on Sunday 23rd April, starting with Play & Move with Tmesis Theatre. Children aged 3 to 6 years are invited to come and play, create, move, explore and get physical with Tmesis Theatre. The session will encourage active participation and interaction between children in a fun and relaxed manner. Brings your little monsters to a Puppet Making Workshop with Headstrung from (ages 7 to 11) and 1pm – 2pm (ages 3 to 6). They can pop in and make a monstrous new friend, then invite them along to The Monster Disco! 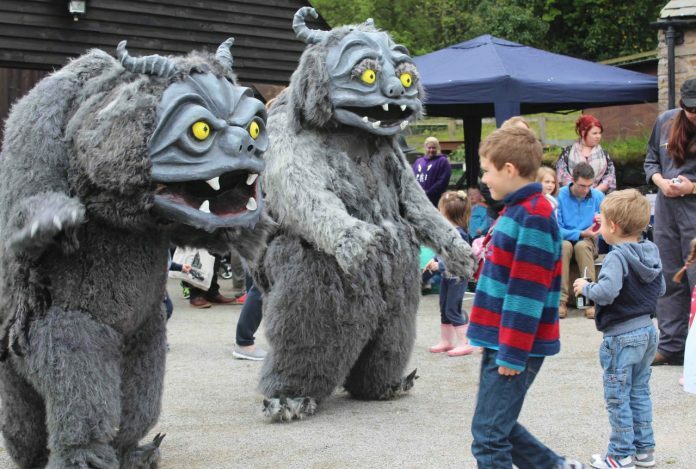 Come and dance with the giant beasts! Bring your dancing shoes and your best moves and come and join the fun – fancy dress encouraged! Liverpool based Artemis Productions will be animating Bluecoat’s gardens with their nature inspired Bob and Gerry, an oversized flora and fauna duo and the incredible Praying Mantas… but watch out they may be hungry! While Young Fest is free, booking is strongly recommended to avoid disappointment. Tickets are now on sale visit www.thebluecoat.org.uk or ring 0151 702 5324 to secure your place on Young Fest events.